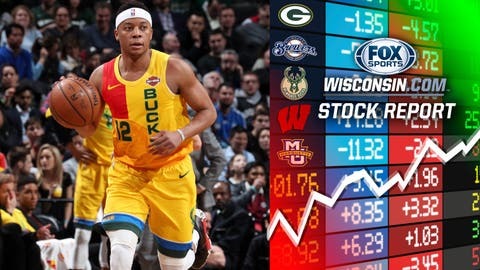 Picked up by Milwaukee after Malcolm Brogdon went down with an injury, Frazier had seen sparse playing time with the Bucks. While he combined for around 25 minutes in his first two games, he played around eight minutes total over the next four. But with most of the team sidelined with injuries, Frazier was pressed into the starting lineup Sunday against Atlanta … and then proceeded to play 53 minutes. It marked just the 19th time in franchise history -- and the 16th player overall (Kareem Abdul-Jabbar did it three times) someone had played as many minutes. Frazier finished with 20 points, 15 assists (the most for any Bucks player with 53+ minutes) and seven rebounds. 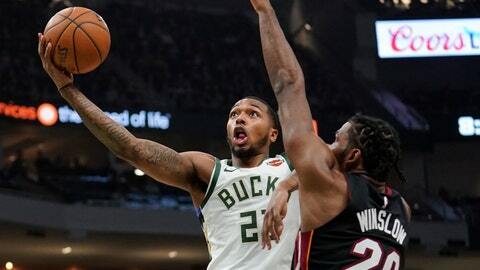 He followed that up Monday by playing fewer than half the minutes (22), but still producing seven points, seven assists (with only one turnover) and three rebounds. Entering Wednesday's game, last year's National League MVP is hitting .409, with a hit in each of Milwaukee's first six games. 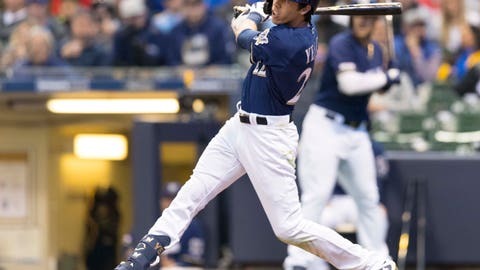 Seven of Yelich's nine hits being for extra bases (three doubles, four home runs) and he delivered with a home run in four straight games to open the season (a record for an incumbent MVP). He delivered a game-winning, two-run double on Sunday and scored the go-ahead run in the ninth inning on Monday. Yelich also has twice as many walks as strikeouts (six to three). This just in: Yelich is pretty good at this hitting thing. We can't claim Hader is unhittable -- after all he has allowed all of (checks notes) one hit so far. Throwing mainly fastballs, like Yelich, the electric reliever has picked up right where he left off. 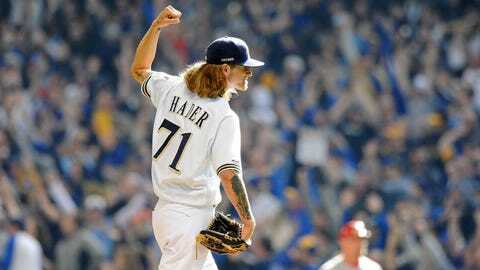 In five innings he's allowed two baserunners and struck out 10 (18.0 per nine innings) and has notched a save in each of his first four appearances. His ERA is a tad high (4.22) but Chacin has allowed only 5.1 hits per nine innings and has struck out 13 batters in just 10 2/3 innings. He's also won both of his starts, working into the sixth inning both times, and is 2 for 4 at the plate, including his second career home run (the other was hit in 2013 in Colorado -- does that really count?). 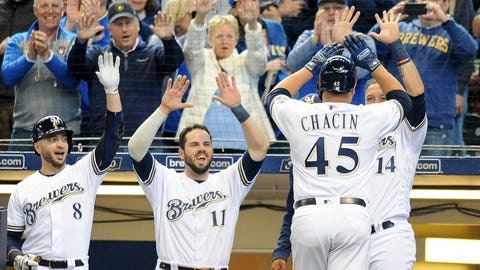 The Brewers need Chacin to be their ace and so far, so good. 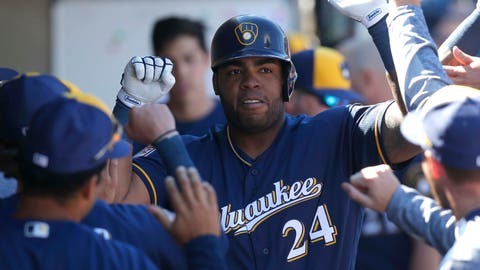 Entering Wednesday, Aguilar had played in five of Milwaukee's first six games and was just 4 for 20 with no extra-base hits. It's obviously still waaaaaaaaaaaaaaaaaaaaaaaaaaay too early to worry about any player, but Aguilar hit .245/.324/.436 in the second half last year compared to .298/.373/.621 in the first half. Over the next few weeks and months we'll see which is the real Aguilar. Like Frazier, Brown is getting more playing time due to Milwaukee's rash of injuries. In three games last week, the second-year guard averaged 30.9 minutes, 18.9 points and 4.7 rebounds while shooting 51.2% from the field, including 45.0% from 3. Against the Hawks, Brown poured in a career-high 27 points -- making 5 of 10 3-pointers -- to go with nine rebounds, three assists, three steals and a block.